In today’s world, we are trained as consumers to never buy large home improvement items without ensuring a warranty is in place. But what does a warranty really mean? And what does it do for you as a consumer? Warranties with lifetime guarantees sound great and can boost the sellability of a product; but does it truly have value to you as a homeowner? Before you purchase hardwood flooring, it’s important to understand exactly what product warranties cover, and more importantly, what they do not. Manufacturer warranties were designed to protect the consumer if they purchase a product that is found to be damaged or defective in some way. The manufacturer guarantees that its product is usable for its intended application. Since hardwood planks are made from natural materials, certain imperfections are naturally assumed to be a part of the final product. The industry realizes this, and thus allows the manufacturer leeway of approximately 5 percent of the total purchased planks. This includes things like finish imperfections, grading discrepancies, milling defects, color differences, and so on. If the defects are beyond this variance, the manufacturer typically agrees that it will repair or replace the defective price or offer a refund. These warranties will guarantee the milling, grade and moisture content of the wood manufacturer, and guaranteed the planks are stable, won’t split crack or warp if properly installed. Many top name manufacturers will offer lifetime structural warranties, and detail out specific prep and installation guidelines that must be followed to keep the warranty valid. If you as a consumer know these upfront, you can be more aware of the flooring contractor you select for help with installation, and verify criteria is met to keep your warranty active. As the name implies, a finish warrant covers that the finish on the hardwood will not wear off under normal use. 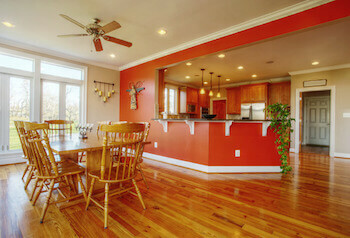 Make sure you choose residential or commercial finishes, depending on your use. Almost all finish warranties will come with a limited time factor; industry standards for residential finish warranties tend to hover around 25 years, with commercial being somewhat lower because of the heavier usage. Finish warranties often have a lot of caveats, and will not protect against scratches, dents, gouges or damage caused to foot traffic or dragging things across the floor. The best advice to consumers is to read the fine print, and be sure to ask your flooring contractor for all the details before making your final decision.